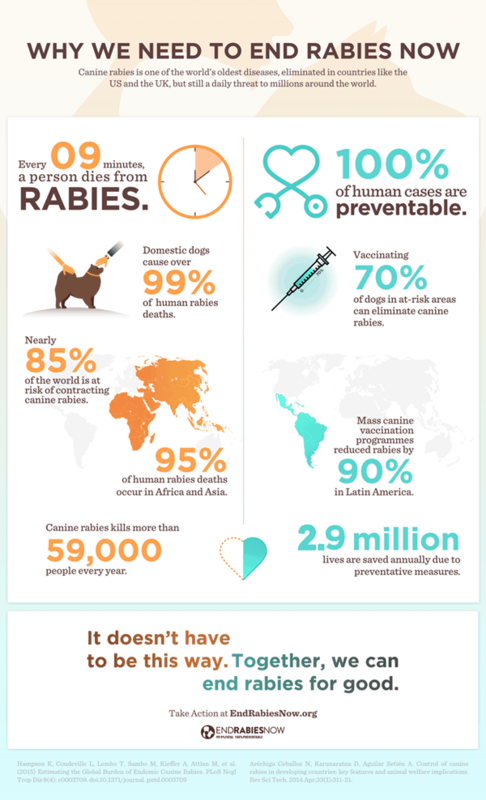 FCVC knows that in the United States, rabies is not the threat that it is in the rest of the world. However, rabies remains a major concern worldwide, killing more than 55,000 people every year. In the United States, one to two people die annually, and there were more than 6,000 reported cases of animal rabies in the U.S. in 2012. That’s 59,000 people every year. Our work isn’t done yet. Rabies is 100% preventable. In the U.S. and many European countries, a dog bite rarely leads to death. But in many countries, even a superficial dog bite or scratch can lead to a disease that is nearly 100% fatal once symptoms manifest. Rabies is one of the world’s oldest diseases, but remains a daily threat to millions around the world. Over 120 countries are still affected by canine rabies. Rabies is a disease of poverty and mainly affects people living in marginalized societies. Over 95% of the 59,000 human rabies deaths each year occur in Africa and Asia as a result of being bitten by an infected dog. And around half of all dog bites and rabies deaths occur in children under 15 years of age. An ancient disease first documented in Babylon, 2300 B.C., rabies has one of the highest fatality rates of all infectious diseases. Once an individual shows symptoms, it is considered to be 99.9% fatal. But it doesn’t have to be this way. In fact, in the United States and many countries in Europe, effective policies and funding have led to the complete elimination of dog rabies. But elimination of dog rabies in these countries has also led to a lack of prioritization for funding and support to eliminate the disease across the world. Canine rabies is a forgotten disease of the poor, where nobody survives to tell the tale. The lack of disease diagnosis and reporting prevents rabies becoming a higher priority disease. Only 54% of survey respondents in urban slums in India knew that rabies is a deadly disease. Only 30% of Ethiopian respondents believed that immediate care of bites was important in preventing rabies. A key factor in preventing the spread of rabies in endemic countries is education. Post-bite vaccines are not always available to bite victims in resource-poor regions where they are most needed. The average cost of post-exposure treatment in Africa is around $40, and in Asia it’s $49. Given that the average daily income in these countries is $1-$2, that expense can be nearly impossible for families to cover. Vaccinating at least 70% of dogs can eliminate human rabies deaths, and low immunization results (50%) can still provide a reasonable chance to control the disease. Inhumane mass killing of dogs, though widely prevalent, does nothing to halt the spread of rabies, and can even worsen the problem. We know how to end rabies. With commitment and funding from donors, local governments, countries and institutions we can end human deaths from canine rabies by 2030. A number of countries have committed to ending human deaths from canine rabies, including Kenya by 2030, the first country in Africa to do so. The ASEAN countries have committed to elimination of dog-transmitted rabies deaths by 2020. In the Americas, several countries have already succeeded in eliminating canine rabies deaths under the Pan American Health Organization’s region wide program, and only 7 out of 35 countries still report human cases. The UN’s Sustainable Development Goals include the aim to end the epidemics of neglected tropical diseases, including rabies, by 2030. The world has the tools it needs to End Rabies Now. It is time for the international community to come together to help rabies-endemic countries to end deaths due to canine rabies once and for all. By vaccinating 70% of dogs, countries can create “herd immunity”, effectively slowing the spread of rabies until it dies out entirely. The One Health approach recognises that human and animal health are connected, and that collaborative cross-sector efforts are needed to end zoonotic diseases such as rabies, transmitted from animals to humans. 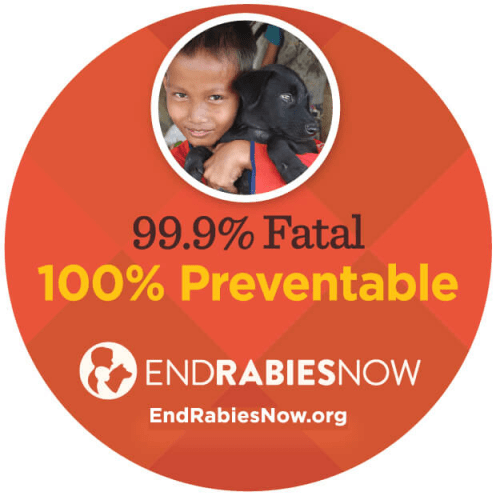 Rabies elimination plans must include human and animal government agencies, veterinary and human health professionals, educators, scientists and community groups. The Canine Rabies Blueprint’s Stepwise Approach towards Rabies Elimination is a roadmap for countries to help them develop plans and measure progress toward achieving rabies prevention, control and elimination. It integrates One Health principles to help countries become rabies-free. Vaccinating DogsAccording to the Pan American Health Organization (PAHO), a number of countries in Latin America have reduced human and dog rabies by over 90%, thanks to mass dog vaccination.With a minimum of 70% dog vaccination coverage, countries can effectively end dog-transmitted rabies in people for good. Safe and effective vaccines are available, and this method is the only way to eliminate the disease at its source, besides being the most cost-effective solution. Every year, almost 30 million people receive treatment, following a bite from a dog that is rabid or suspected to have rabies. This treatment is estimated to prevent millions of rabies deaths annually. Pre-exposure vaccines are also available for individuals considered to be at high risk for rabies infection, including travelers to rural areas of endemic countries and workers who could be exposed to the live rabies virus. Raising public awareness of rabies, including how to prevent dog bites, vaccinating dogs to prevent the disease, and appropriate treatment and care if exposed to the virus, is critically important to end rabies and save lives. Laboratories and systems need to be put in place to diagnose cases of rabies in both dogs and humans, and to monitor the progress of control programs. Once rabies has been controlled, this will also help to keep the area rabies-free. Your pledge becomes a voice for the millions of people and animals around the world vulnerable to rabies. Diverse global support from individuals and organizations tells world leaders to make the elimination of rabies a priority. You can sign up for the pledge by clicking here. FCVC hopes that you found this article engaging and enlightening. Need to know if your pet’s rabies vaccinations are up to date? Give us a call at 970-587-5140.